Colorfully textured walkways at the Miami-area Fairchild Tropical Botanic Garden. t was easy for adults to become children when they wandered around NightGarden. Seeing colorful fairies fly through the air, hearing gentle words of wisdom from a kind old talking tree, and marveling at sites like illuminated blue water lilies and purple palm trees tends to have that effect on even the most sensible realist among us. This kind of magical experience made the 23-acre walk-through attraction, open from Nov. 23 through Jan. 6, one of Miami’s top holiday activities. 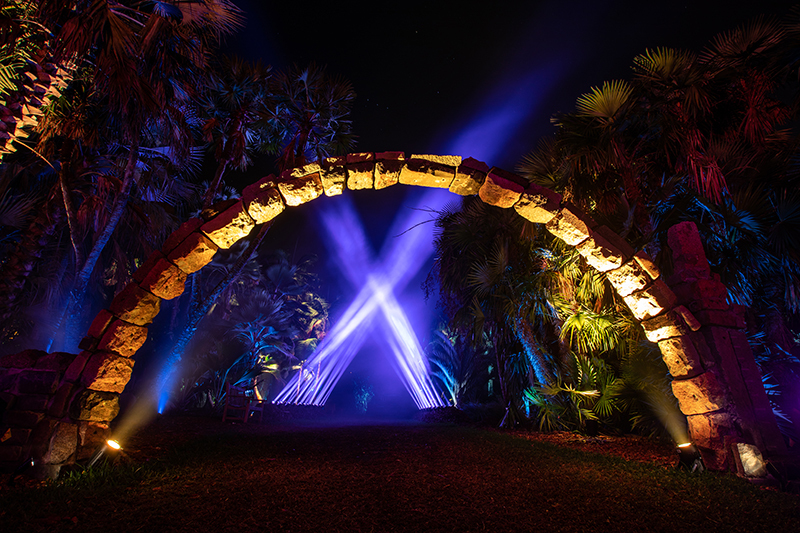 Produced by Kilburn Live, the after dark escape from reality took place at the world-famous Fairchild Tropical Botanic Garden, a venue that provided a fertile background for Chris Werner’s imagination as its lighting designer. Werner used over 640 fixtures supplied by 4Wall. The lighting fixtures were arranged and programmed to reveal a slowly unfolding narrative that evolved and flowed with visitors as they ventured through the magical nocturnal garden. “Our design process began with a thorough evaluation of the storyline established by Max in an effort to determine the color palettes that would be most prominent in the exhibit” says Werner. “Once we settled on a color story dominated by cooler hues like blues, greens and cyan, we focused on fixture selection and placement. Our concept was built around the unique attributes of Fairchild Tropical Botanic Garden. With Max’s arc and my aesthetic in-mind, we set out to draw this beast, striving to get the most from our equipment. It was important creatively to endow the environment with life. We chose effects that evoked the feeling that the garden itself was breathing. We relied on slow pulses and gentle undulations of light to create the living transformation we desired.” Creating even more vivid demarcations were the sudden appearance of custom gobos created by Lucy Dixon that depicted animals and fantasy characters. 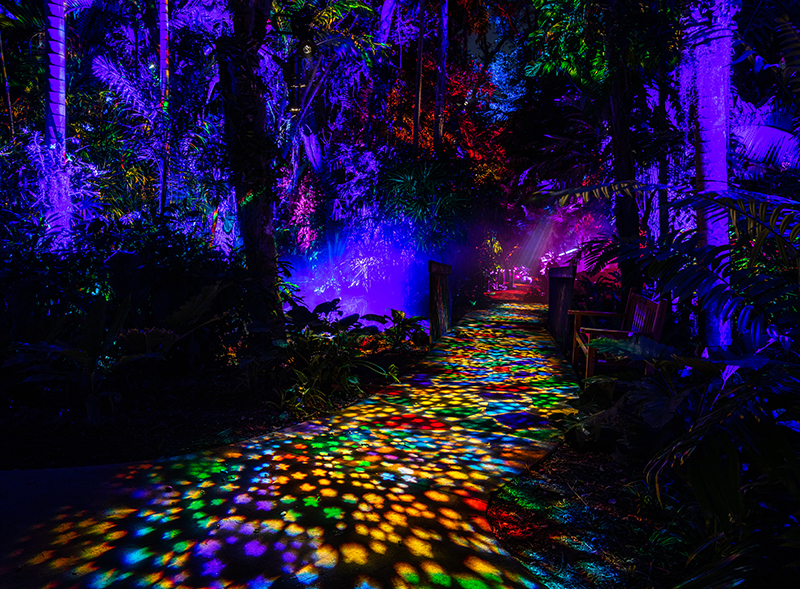 NightGarden at Fairchild Tropical Botanic Garden. More than half of the fixtures in Werner’s rig (336 units) were Chauvet Professional COLORado series fixtures, which Werner describes as the “workhorse” of his lightshow. 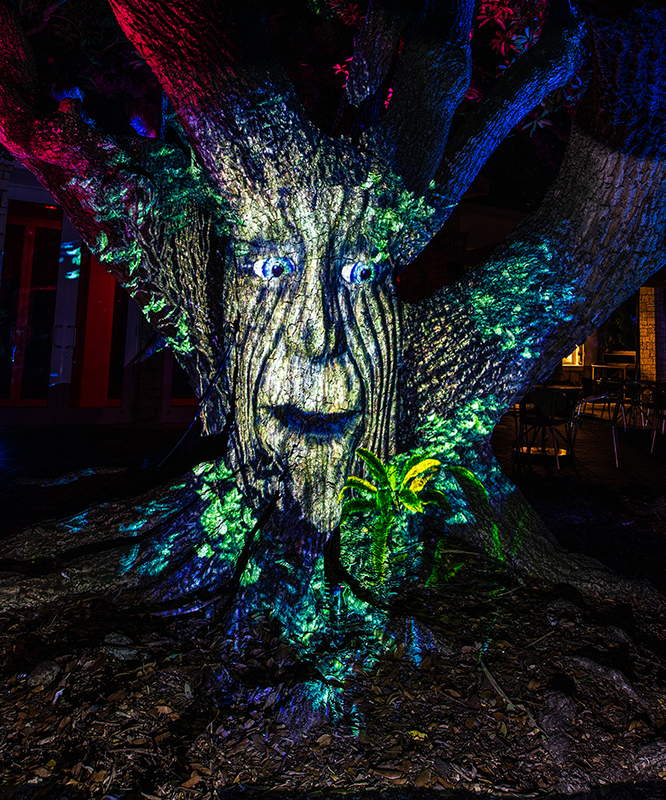 He relied on the COLORado Solo fixtures along with Chauvet Professional COLORdash Quad units and Elation WW Profile IPs to illuminate trees, foliage and pathways in a lavish variety of colors. “Deep, saturated colors allowed us to heighten the theatricality of the already-striking gardens. That use of color was critical to creating the enchanted, unique experience for our guests,” says Werner. Subtly changing colors along the NightGarden path was one way that Werner ensured that each phase of a visitor’s journey was different than the ones that proceeded it. He also created different moods throughout the exhibit by varying the texture of his lighting through color overlays and gradual changes in intensity levels. Occasionally, there were moments of pronounced change at pivotal points in the walk-through experience as a result of dramatic pan/tilt movements of bright beams of light. Nowhere was this sense of movement more evident than in the “Dance of Lights.” Taking place midway through the NightGarden route, this series of 12 two-minutes sequences captivated the crowd with its music and synchronized time-coded lighting that featured Elation Proteus HYBRID fixtures. 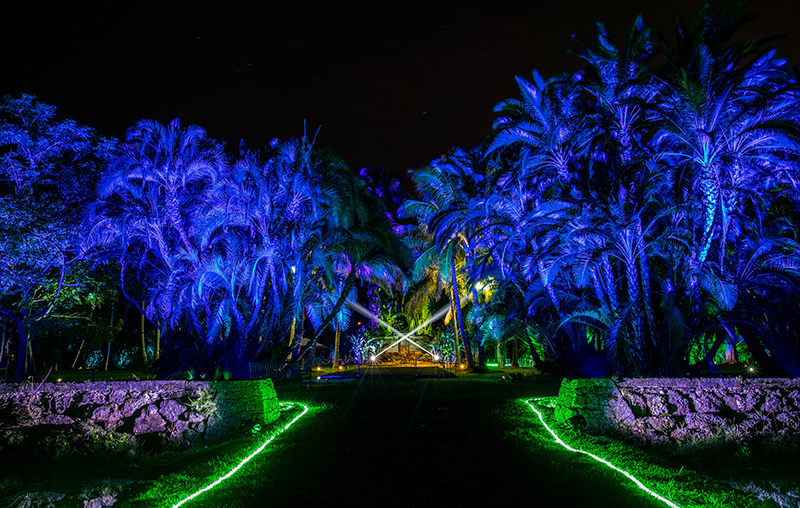 Adding to the impact of this experience were 18 Chauvet Professional Strike 1 fixtures that highlighted an island of palm trees in the middle of the “Dance of Lights” performance space. The NightGarden show was run on a grandMA2 Light console with an active backup desk and a pair of NPUs located within a centralized control room. Werner’s team utilized a series of layouts for pixel-mapped control of the facility, allowing sweeps of color to slowly roll through the gardens. Nearly 50 universes of Art-Net and sACN were distributed over a robust, temporary fiber network throughout the property. This network was shared Audio, distributing the Dante protocol to speakers in all locations. Underlying the dramatic lighting display in NightGarden was a practical and diligent attention to detail. Temporarily installing heavy fixtures within the garden required a customized mounting solution, and Werner credits the team at 4Wall Pennsylvania with designing and fabricating brackets that strapped securely around the trees without damaging their trunks. flourishes that were intended to stand alone. For example, near the exhibit’s entrance was a wall of light created with 24 Chauvet Professional COLORado Solo Battens. Oriented vertically, these fixtures were attached to a truss structure with a silhouetted NightGarden logo. This display proved to be very popular as a background for selfie shots.